Well, when we tore out the old island I knew exactly what I wanted to replace it with. Some decisions I waver a bit and can’t make up my mind, but not this time. 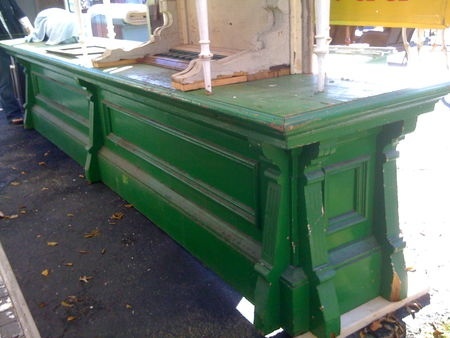 I knew I wanted to find an old store counter and convert it. Yup! That is what I wanted. 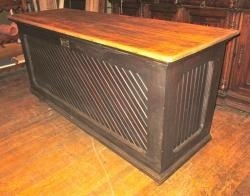 I looked around several antique stores where we live and some in the bigger towns close by. Nothing, nada, zip, there wasn’t even anything close. Well a trip to my sons was coming up. He lives in a metro area, and near a large antique district, surely I would find it there….. 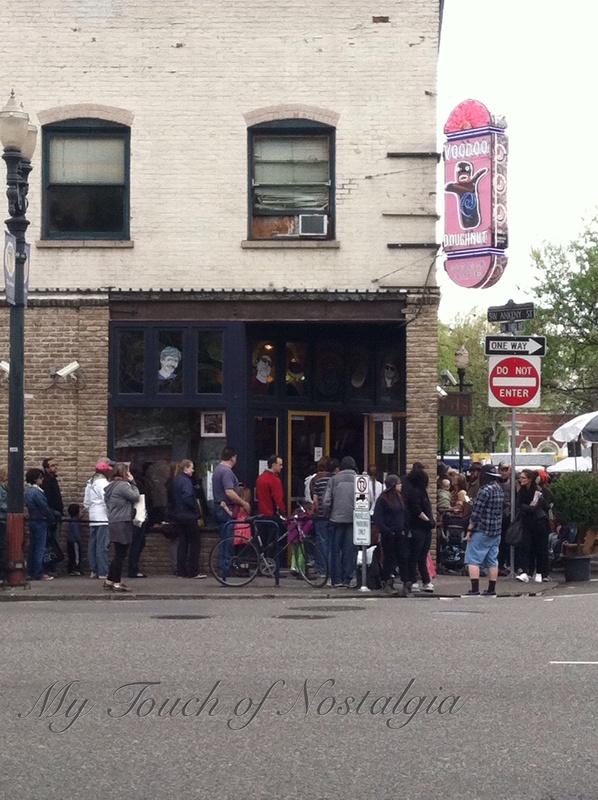 Here is the line outside VooDoo doughnuts. Yes we had one, and the line was short when we were got ours! It doesn’t show in this photo but the line wraps almost around the block! I did find some great things at IKEA for the kitchen, but we never found an old store counter. Great food and time was had on my visit. So on to plan B- build one. I looked for some inspiration, measured my area, and found out that the “ready made” cabinet we had leftover from the unused bathroom vanity would be perfect to start with. We had Bead Board leftover in the garage from a remodel project. I needed to make it wider, so my friend Frank stopped and picked up some ready made, unfinished cabinets for me to “alter” on both ends. 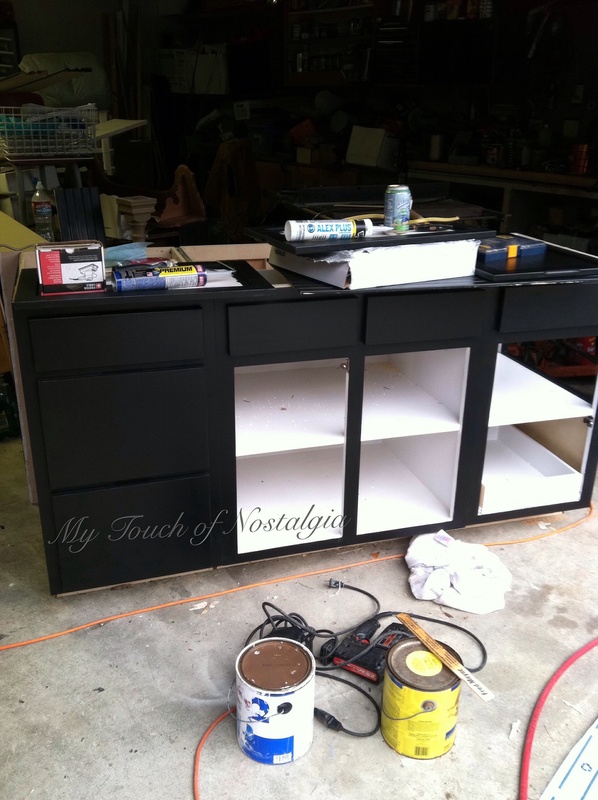 She had a great idea of the black, (which I loved, she has now changed hers) and it included bead board (which I knew my cabinets would be) plus I had a few ideas up my sleeve to make my own “old general store counter”. It started with being modified, and base coated. I sure wish I knew about milk paint then. I know I would have gotten the perfect look I was after without all the fuss. I guess I didn’t take a lot of photos of this part, but it is pretty boring.